Our personal injury lawyers are dedicated to assisting injured persons in achieving diagnosis, treatment and compensation throughout the region of Guelph Ontario. 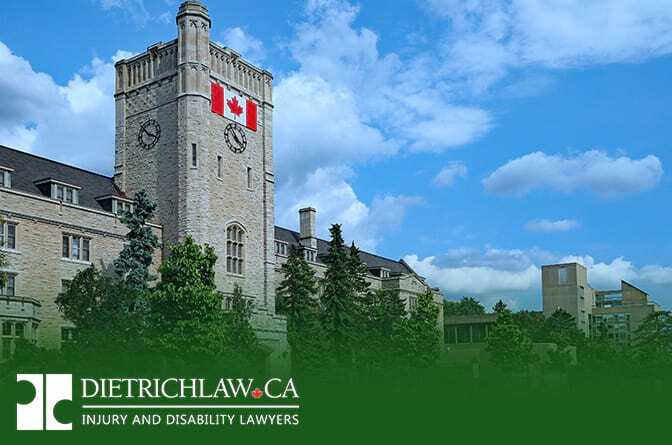 Dietrich Law Office assists clients throughout the region including Guelph, Fergus, Elora, Listowel, Mt. Forest and Durham. Our practice is focused on personal injury law so you can be assured that we have the skills to handle your case. Our lawyers are dedicated to assisting injured persons including victims of car accidents, slip and fall accidents, defective products, motorcycle accidents, dog bites resulting in injury, and other accidents resulting in serious injuries. In Canada, motor vehicle accidents are the leading cause of accidental death and serious injury requiring hospitalization. The good news for Ontarians is that we have among the lowest incidence per capita of car accident injuries, including fatal injuries, in the country. Of some concern, if the reports are true, based on U.S. studies of traffic accidents in states where cannabis has been legalized, there was an increase in reported crashes following the legalization of marijuana. However, it should be noted that the relationship between legalized marijuana and an increase in motor vehicle accidents is not certain since many of the ‘at fault’ drivers in these events were also under the influence of alcohol. It remains to be seen whether our roads will become less safe since recreational marijuana has become legal in Canada but, at this point in time, the primary causes of car accidents are distracted driving, driving under the influence of drugs and/or alcohol, speeding and driver fatigue. Further, collision reporting statistics have consistently indicated that car accidents, motorcycle accidents, pedestrian accidents and other motor vehicle accidents can almost always be avoided and are typically caused by a failure to take due care. Of course, we all make mistakes. But when driver negligence or carelessness causes serious injury to another person, including a passenger, pedestrian or cyclist, then these ‘mistakes’ can have a life-altering impact on accident victims and their loved ones. One such tragic event occurred on the October long weekend when a pickup truck crashed into a car on Wellington Road 44, north of Guelph. The three occupants of the car received fatal injuries; all three were Fergus residents and 17, 35 and 45 years-of-age. Police reported that they are investigating to determine the reason for the Guelph collision. This devastating accident was on the heals of 2 other fatal collisions in the Guelph area. One of these was a single-car collision on Victoria Road involving a 20-year-old Guelph man. An earlier collision involved 2 vehicles that crashed south of Guelph on Wellington Road 46 and resulted in the death of one of the drivers. Unfortunately, these devastating accidents represent only a few of the many serious and sometimes, fatal, car accidents that occurred in the Guelph area in recent months. ‘Damages’ refers to monetary compensation in civil actions. Damages are intended to allow the injured party (the plaintiff) to be in the same position that he/she was in before the accident occurred. Certainly, there is no amount of financial compensation or damages that can make up for the loss of a loved one or for serious life-altering injuries. However, a civil action (or lawsuit) can at least compensate accident victims for their economic and non-pecuniary losses arising from the injury or wrongful death. Under the Family Law Act, families of accident victims may seek monetary damages for expenses they incurred due to the loss of their family member, or expenses incurred while supporting or helping a loved one who was seriously injured. In addition to compensation for monetary losses, family members in a wrongful death case may also seek damages for the loss of guidance, care and companionship they would have received if the death had not occurred. Vokes Estate v. Palmer (2012) is among the most publicized wrongful death cases in Ontario. This case involved the tragic death of a mother, Michelle Vokes, who suffered fatal injuries after the family mini-van was hit by a young driver travelling at an excessive speed (120 km/hr in a 50 km zone). Mrs. Vokes was pregnant at the time of the accident, and her unborn child also did not survive the crash. The accident victim was survived by her husband and 2 young daughters, 3 and 5 years-of-age. The Vokes family was awarded a settlement of $90,000 for Mr. Vokes and $117,000 and $135,000 for each of the surviving daughters, for the loss of care, guidance and companionship. Any of the people injured in a car crash, including passengers, cyclists, pedestrians and drivers, may claim damages against the driver who was responsible for their injuries. Of course, motor vehicle accidents are not the only source of injury for Canadians and lawsuits are certainly not confined to automobile accident injuries. Slip and fall accidents and recreational accidents (including exercise and sports-related accidents) are other frequent sources of injury which can lead to civil actions. Essentially, in circumstances where a person breached their duty to take due care and their negligence created an unsafe condition that caused injury, the accident victim is entitled to sue the responsible party for their losses. Some of the damages for which an accident victim may seek compensation include: lost wages, medical and rehabilitation costs not covered by OHIP, pain and suffering, home maintenance expenses, car and home accommodations, and any other expenses arising from the accident. 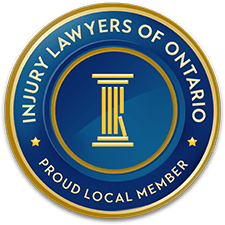 Under Ontario law, persons injured in an automobile accident or during the operation of a motor vehicle may file a claim for Statutory Accident Benefits against the vehicle owner’s insurance policy. These benefits, commonly called ‘no fault accident benefits’, are also available to persons who were responsible for the collision. Notification of the accident and injury must be submitted to the automobile insurer within 7 days or the stated deadline in the policy, or the insurer may have grounds for rejecting the claim (unless hospitalization for a serious injury or another legitimate reason prevented you from applying promptly). Under the standard automobile insurance policy in Ontario, the maximum amount of medical and rehabilitation/attendant care benefit you can receive is dependent on the severity of your injury – catastrophic injuries are eligible for the highest compensation, then non-catastrophic injuries, and minor injuries are allotted the lowest maximum benefit. Accident victims can also claim other losses, such as the income replacement benefit (IRB) for lost wages (up to a maximum amount) or a non-earner benefit if you were not working at the time of the accident. The income replacement benefit is available to claimants regardless of the kind of injury you suffer, whether you have physical injuries, psychological injuries and/or a chronic pain condition, as long as the injury prevents you from working. A death and funeral benefit is also available under the standard policy.